Undated items - modernisation of Village Hall, sale of Trunch House, funerals. 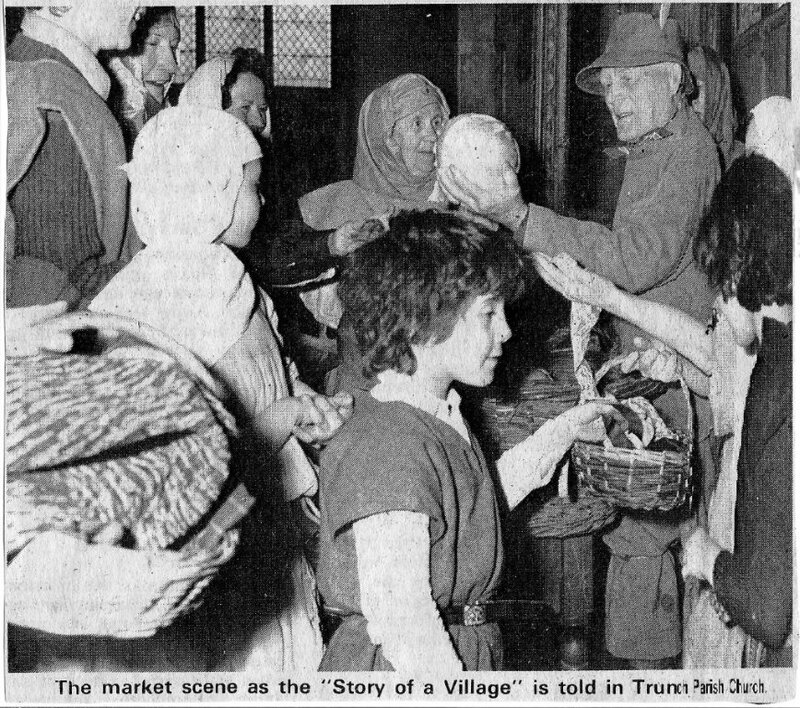 Below is a selection of items from the scrapbook. Click here for a fuller version. 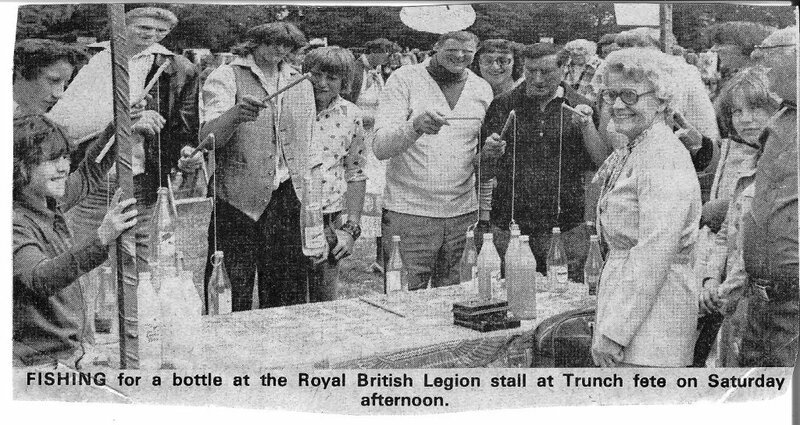 Trunch 1978 scrapbook. make things more simple to manage. The Rev. Featherstone was keen to try to build a new chapel and dispose of the two buildings. their pony cart distributing meat to many surrounding villages as well as to local families. with other old Trunch families such as the Spurgeons, May, Flaxman, Rev Kimm and others. April 8th. 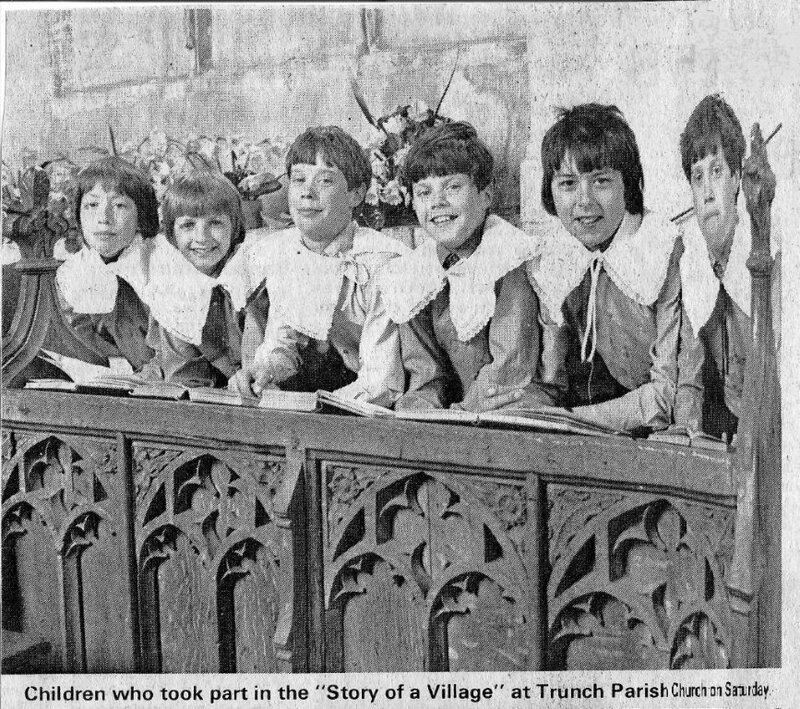 “Trunch – the story of a village” Parish Church 8 p.m.
Bev Leeder has kindly identified the angelic-looking boys in the right hand picture as Matthew Houchin, Alan Yaxley, Paul Temple, Simon Temple, Stephen Reynolds and Peter Temple. entitled “The story of a village” The story began in the year 674 with St. Botoph, the patron saint. Among the cast were the rural dean Rev. Garth Norman, the Rev. Michael Westney and Mr.
gave a humorous account of village life from 1912.
shows and Malcolm Larke’s growing display of tractors , provided something for all. Shield from the Caravan Club. us when we were in foreign lands like Southrepps. concert of the St. Andrews Singers. Friday started off wet but soon cleared. More people than ever joined in Peter’s car rally and the same applied to the barbecue. Molly ran the bar in the garage. The final stragglers were ejected after 11 p.m.
doing The dance rounded off the day. during the war and was a keen gardener and bird watcher, belonging to the RSPB. 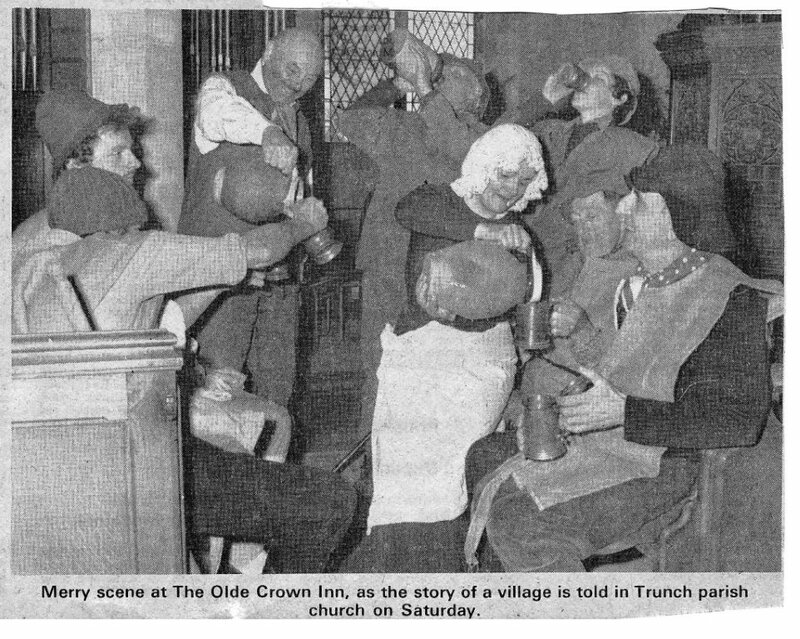 Trunch 72 years ago and from an early age worked for the late Mr. A. May at White House Farm. 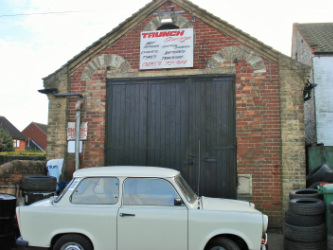 Then for several years he worked at the old North Norfolk Brewery, Trunch - now not existing. returning to his old home at 3 Chapel Road, on his retirement 7 years ago. living in Pyghtle Close was called upon and he quickly arrived to conduct the service.